Take a trip through Wonderland a place that's full of your wildest dreams. It is an exciting journey into the mind of a modern researcher. From ancient medicines, herbs and healings. To meditation, spirituality, soul power and the seven stages of enlightenment. Natural cancer killers to medicinal mushrooms and much more. These truths open the readers eyes to a whole new way of thinking. 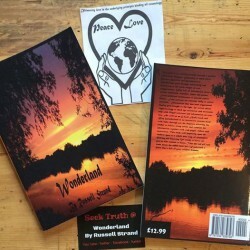 Wonderland is an interactive internet book, with links to web pages, videos and interviews allowing the reader to follow along online. This is the key to knowing all you've ever wanted to know. Take the red pill and follow the white rabbit into Wonderland. Please Like Follow and Share!!!! Be sure to check out the new app too much more coming soon.... Follow us on Facebook Twitter Youtube Instagram Tumblr Goodreads and Smashwords The Book is Available on Amazon Lulu Kindle and Payhip!!! !